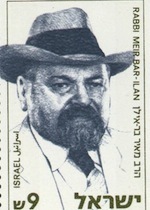 Rabbi Meyer Bar-Ilan (1880-1949), the Jerusalem-based leader of the Religious Zionist movement, visited the United States in 1943 and took part in important meetings with government officials and American Jewish leaders. Bar-Ilan’s three-day mission to Washington in February of that year illuminated the difficulties of trying to influence U.S. policy on refugees and Palestine. He found Senator Alben Barkley (D-Kentucky), the Senate Majority Leader “quite unfamiliar” the plight of Europe’s Jews and the Jewish claim to Palestine. Bar-Ilan appeared to have better luck with the one Republican congressman he met, House Minority Leader Joseph Martin, of Massachusetts. Martin promised to “do whatever possible” to facilitate a congressional resolution about European Jewry, and would “try to do his very best” to press the British on Palestine. He did not, however, take a leading role in subsequent congressional initiatives on those issues. Medoff, FDR and the Holocaust, p.172.